You might already be using the law of attraction when marketing. However, when you really understand how it works you can get even better results! So what is the law of attraction? Well, in three words or less, like attracts like. We are attracted to, and attract, things that are like us. 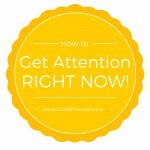 Okay you might be thinking that this law of attraction stuff is really woo-woo or out there. But consider this, in our personal life most of us use the law of attraction on a daily basis. Even is it’s unconsciously. Think about the people you hang out with. Most likely you have similar interests, beliefs and/or values. Like attracts like. 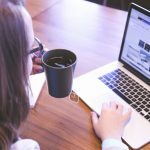 What about when using social media? On networks like Twitter, Facebook and Pinterest we tend to engage more with people who post things that we relate to. Again, like attracts like! Then there are successful people like Oprah Winfrey and comic Jim Carrey who’ve said that they’ve used the Law of Attraction to further their careers. However, when marketing met the internet things really changed. Suddenly the intricacies of understanding how the law of attraction works became vital for success. 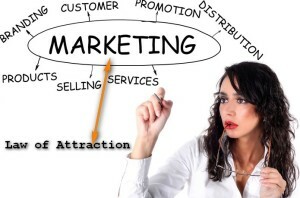 The cyber world turned marketing into the law of attraction on steroids! The internet has made it possible for buyers and sellers to find each other in seconds. All a customer has to do is type specific words, phrases or questions into their favorite search engine. Then BOOM! A list of corresponding websites, blogs, products or services appears or doesn’t appear. Which Clients Do You Want to Attract? Because buyers can find you, or not, in seconds, it’s important to know the type of buyer you want to attract – before you do any marketing. Wow. That is a broad target market. Sorry for the bad pun. Anyway, let’s get back to the example. Yes, a lot of women could be dealing with stress. However, each age group experiences stress for different reasons, i.e. when getting married, or when raising kids, or while running a business, or dealing with divorce, or going through menopause, or looking after aging parents, or when anticipating a lack of cash for retirement….you get my point. However, when doing an internet search, each woman would be looking for answers to a specific problem related to stress. Then depending on that problem, and other factors like her income, ethnicity or education (demographics), and her lifestyle (psycho-graphics), our female internet searcher would be attracted to certain sellers, websites, blogs and social networks. Remember, like attracts like. So I’ll say it again. 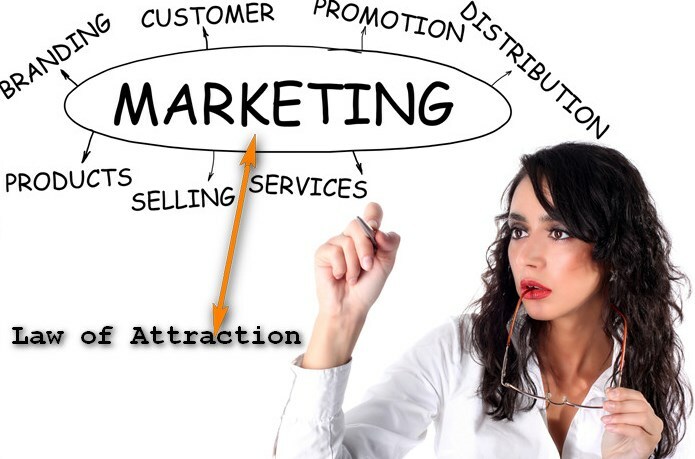 To really benefit from the law of attraction, it’s important to SPECIFICALLY know who you want to attract, before you put any type of marketing plan together. To get the most out of the law of attraction you should customize your products and services to meet the needs of your ideal client. This next piece of information might seem like a huge to-do list. But don’t panic. The items can be done in stages. So here goes. To attract the right clients you should also customize your logo, tag line, communication style, blog topics, and the look and feel of your website to fit the personality, taste and expectations of your specific buyer(s). Whew. That was a big list. When your brand is fully in place, a potential customer will feel like you invited them over, rolled out the welcome mat, and put clean sheets on the guest bed just for them. To get even more out of the law of attraction, post articles, updates and photos on the social media sites most frequented by your ideal client. Trying to post on the other nine million or so social sites can be a colossal waste of time. Once you find the sites that your buyer and/or audience belongs to you need to engage. You do this by liking, sharing, commenting, and thanking. Obvious I know. But I had to say it. Here’s why. Today customers want to get to know you, and trust you, before they commit to anything. 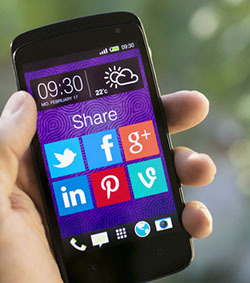 Social media creates a great opportunity for potential buyers to check you out before contacting you. 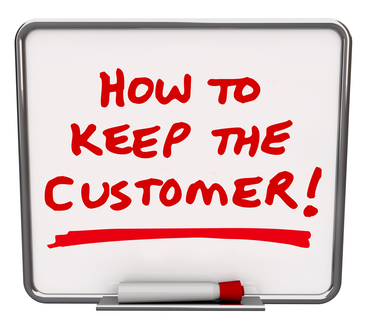 The law of attraction also plays a big role in keeping customers. Here’s how. Studies have shown that what really builds brand loyalty are your shared values. For this reason, it’s important to identify what your business stands for. Then promote it. To sum it up, not only does like attract like but it keeps your ideal buyer coming back for more. Can I hear an amen for that! There is a situation that I’ve seen over and over again. It’s when the law of attraction doesn’t work. The law of attraction doesn’t work when you try to market to people or companies you don’t relate to. It also doesn’t work when you try to sell something you don’t like or believe in. Wondering why? Well, if you’re not sold on what you’re selling, or who you’re selling to, your business isn’t even attracting your interest. On the flip side, when you’re passionate about your business, clients will flock to you. How come? Passion is contagious. When you’re excited people want what you’ve got. I’ve seen that over and over again too. The saying, do what you love and the money will follow, really is true. 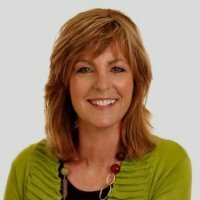 After building three successful companies of my own, and helping hundreds of entrepreneurs and small business to market and grow, I can help you to define, develop and implement your business growth and marketing plan. I have bucket loads of easy and creative ways to achieve the goals outlined in this article. Oh wow, I really needed to read this today and I guess that’s why I’ve kept this post in my Pocket for awhile. The funny thing is that I know all of this. Am I great at it all? Obviously not… I’m fixing to rebrand my blog and head back in a direction I had been in a few years ago but got detoured along the way mainly because I was giving my audience what they wanted. I need to be much more specific now though and that’s what I’ve been thinking a lot about lately. This post came at just the right time for me as I’m restructuring everything and eager to get back on track. You definitely attracted me to you my dear and thank you for being so clear on this topic. Just what the doctor ordered. I am so glad that you found the article helpful and timely. Thank you for letting me know. Interestingly, one of the things on my ‘client attraction list’ is to be of service to established entrepreneurs and small to mid-sized business. So I would say that this was a good match! I know I sometimes sound like I’m whining but it’s not always so easy, even with the laws of attraction. My major problem is that I’m great on social media but my main target audience isn’t on it. So, I have to try to find more traditional ways to get to them, and because I know the industry I already know what’s not going to work, thus I’ve already talked myself out of it. Instead, what I’ve found via the laws of attraction is when things seem to be close to getting to their worse my activity ramps up and I get something… maybe not exactly what I’m hoping for but, as The Secret said, you don’t always get what you want in the way you wanted it. As you’ve observed, we can also attract what we don’t want with our thoughts [beliefs and actions]. Some would refer to it as a ‘self-fulfilling prophecy’, which can become a cycle. If I ever fall into what I call the ‘stinkin thinkin’ trap, with any negative or pessimistic thoughts, I quickly pull myself out by listing all of the things I’m grateful for. Within seconds I am in a positive mental state. This enables me to come up with great ideas. Interestingly, by consciously thinking positive thoughts, the brain will create new neural-pathways to those positive thought patterns. Over time, neural-pathways to the negative thought patterns will die off. This makes it so much easier to see the glass as half full instead of half empty. For what it’s worth, I’ve shared this info with many of my clients. Those who practiced focusing on positive outcomes saw big changes in what they were able to create and accomplish in business. You are spot on with this topic of LOA! I like to reference LOA in my blog posts by saying “like attracts like” frequently because it’s true. First time I heard of it was when I was in network marketing. Each member of our active team watched “The Secret” which hyped us up. But then I got the real scoop from listening to Kevin Trudeau’s “You Wish Is Your Command” and Abraham Hicks. You don’t realize how much you’re using LOA untim it’s pointed out to you. For me it was when I started doing marketing. It just amazes me of how it works whether consciously or unconsciously! But I have to say that I love it! Great post Kelly! Have a great weekend! 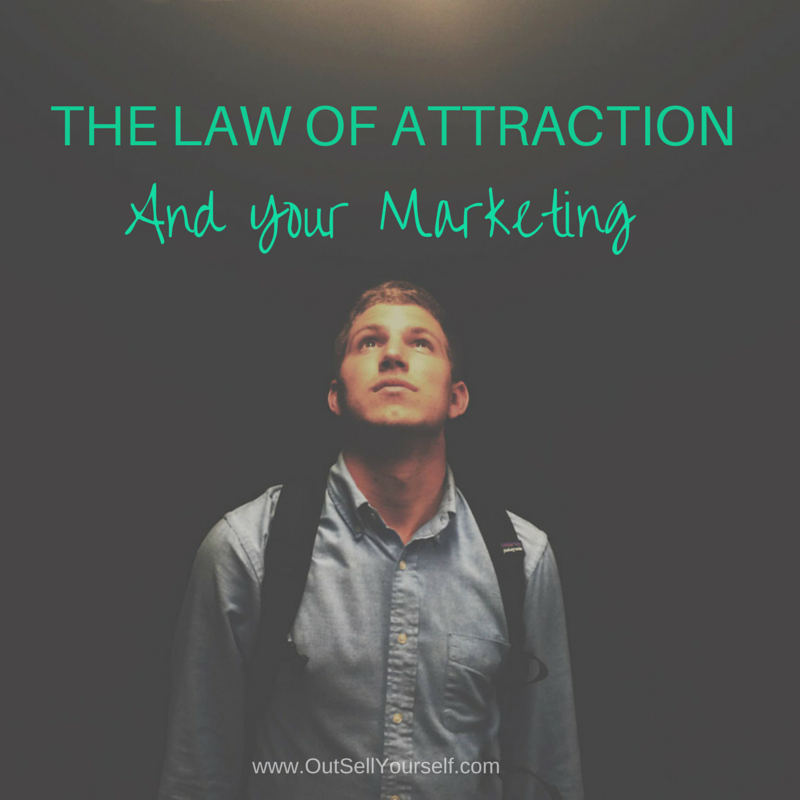 Thanks so much for sharing your experiences using the law of attraction in marketing.